Created by Bob (Supergirl ) Oksner, Cairo Jones was supposed to be a male detective, but because fiction in general, and comics in particular, were already flooded with them, Cairo became a hard-boiled female detective! Along with syndicate writer Jerry Albert, Oksner illustrated the strip's entire run from 1945 to 1947. 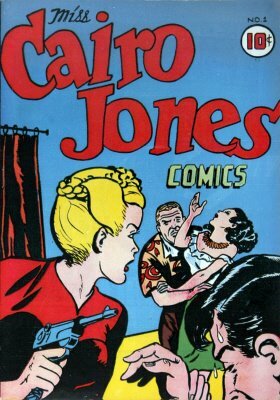 Miss Jones made only one appearance outside of her newspaper comic strip, in a one-shot comic book reprinting the first strip's continuity. It is from that issue that we've digitized and remastered the cover art that Atomic Kommie Comics™ now re-presents Miss Cairo Jones as part of our Heroines™ line of kool kollectibles. Have a look at the female sleuth who was equal to any male gumshoe!